Vapor Couture is a unique line of e-cigarettes that combines the trusted technology of V2 Cigs with highly elegant designs and stylish accessories that are designed specifically with female vapers in mind. Here are the current Vapor Couture flavor cartridge options. Just click the pic below to see more about them! • Bombshell - A rich and spicy flavored tobacco blend, Vapor Couture's Bombshell flavor is perfect for the Turkish tobacco lover. • Rodeo Drive - Like its namesake, the Vapor Couture's Rodeo Drive flavor cartridges embody American elegance. This hearty tobacco blend is a favorite of anyone who prefers the taste of classic American tobacco. • Fresh Mint - The delicious menthol flavor of Vapor Couture's Fresh Mint cartridges is truly one-of-a-kind, and a favorite of many menthol lovers. • Passion Fruit - Satisfy your craving for something sweet when you get Vapor Couture's delectable Passion Fruit flavor cartridges. This tropical flavor is fun and fruity, and oh so yummy! New Vapor Couture flavors coming soon: Strawberry Champagne and Arctic Mint! When it comes to e-cigarette batteries, Vapor Couture has a wonderful variety of gorgeous colors and patterns, all of which are sure to stun and impress all those who see you! You can personally design your e-cigarette to perfectly match your own personal style and preference. What a way to express yourself! 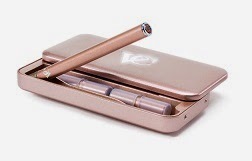 E-cigarettes For Women - Elegant & Pretty! Vapor Couture has brought both elegance and beauty to the world of vaping by offering the only line of e-cigarettes that is designed specifically for women. Created by the leading e-cig brand, V2 Cigs, Vapor Couture offers the most beautiful and elegant e-cigarettes available anywhere. With their sparkling crystal-tipped batteries, they are simply to die for! Each Vapor Couture battery is finished with a sparkling crystal tip (jewel-tip), and a matching LED light that sparkles and glows with each puff. 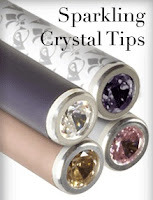 The current crystal tip choices are: a white faceted crystal tip, a purple crystal tip, a gold jewel tip and a purple jewel tip. VC Smartphone Clutch - a stylish genuine leather case that protects your batteries and cartridges. It also has space for your cell phone, credit cards and a few other things. It's available in black, crimson, plum and white. 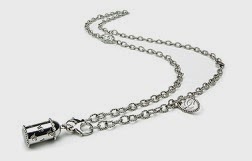 VC Fluted Link Charm Necklace - Available in both sterling silver and stainless steel, it allows you to carry your e-cig in style. It has two detachable lobster clasps that also allow you to turn it into a stylish bracelet. VC Portable Charging Case - Charge on the go! This beautiful case allows you to charge your battery up to six times before it needs to be reconnected to a power source. It has enough room to store two Vapor Couture cartridges and one battery. It's available in several colors. 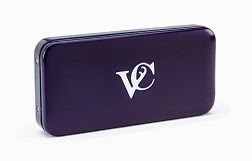 VC Metal Carrying Case - Slim and sophisticated, this carry case allows you to carry and store two cartridges and one battery. It's available in brushed platinum, deep purple and rose gold. All of these accessories are beautiful, elegant and built to last. They also offer other vaping accessories, such as a car adapter charger, and wall adapters for both the UK and EU. Should I Choose Vapor Couture? First of all, Vapor Couture is owned by V2 Cigs, which is one of the most trusted e-cig brands today, offering great vapor production, superb reliability and a Lifetime Warranty. In addition, Vapor Couture is the only e-cigarette brand that is designed exclusively for women! Nowhere else will you find such eye-catching elegance, high-class style, and overall beauty when it comes to vaping. Not to mention, exceptional quality and reliability. Bottom line, the entire product line is simply gorgeous! In fact, we'll wager that you won't find a more beautiful e-cig anywhere. They really put a lot of thought and love into this line and the end result is quite evident. "The colors, size, style, and flavors are all exactly as described, and the set is beautifully packaged, similar packaging style to that of a Louis Vuitton or Coach purse, down to the cloth bag!" If you're looking for an amazing e-cigarette that offers excellent vapor production, excellent reliability, and exceptional style, then Vapor Couture is definitely where it's at. They've found a way to offer top-notch products that are not only dazzling and pretty, and but totally reliable as well.